For anyone who cares about reducing gun violence, it was Sen. Dianne Feinstein who asked the key question of Supreme Court nominee Brett Kavanaugh. The California senator demanded that Kavanaugh reconcile his opposition to assault weapon bans with the growing frequency and increasing deadliness of mass shootings. And that is where Kavanaugh parroted the gun lobby’s talking points -- falsely arguing that we can only prevent the mass shootings that occur in our nation’s schools by “hardening” schools. National Rifle Association executive vice president Wayne LaPierre has said the same thing for years. “We must immediately harden our schools,” LaPierre said after both Newtown and Parkland. Kavanaugh also claimed that assault weapons can’t be regulated because they are already in “common use.” That’s absurd. No federal appeals court has ever found that assault weapons -- which are similar to the dangerous firearms our men and women use in war -- are protected by the Second Amendment. Four federal appeals courts have upheld state-based assault weapon bans, arguing that the government can constitutionally limit particularly dangerous guns that are designed to kill as many people as efficiently as possible. If Kavanaugh is confirmed, a representative of the NRA will effectively sit on our nation’s highest court. In a country with more guns than people, we will have a Supreme Court justice who will pervert the Second Amendment even further in order to expand the market for gun makers. After all, if we are to follow Kavanaugh’s logic that popular firearms in “common use” cannot be regulated by the government, then the gun industry can flood our communities with new dangerous weapons and the government will be rendered powerless to stop it. If millions of people print untraceable firearms using a 3D printer, then regulating them too would be unconstitutional. The tragic reality is that with more guns and with easier access to them, there will be more mass murders in our schools, not fewer. Americans will experience more gun crimes in our communities and higher rates of suicide as well. The NRA is pushing hard for Kavanaugh. And why wouldn’t it? The judge would allow the gun lobby and industry to shape the contours of our Second Amendment. The NRA is spending $1 million on TV ad campaigns supporting his nomination and has built out an aggressive digital toolkit on its website urging its members to call their elected officials and support his nomination. Kavanaugh’s views stand in stark contrast to the general public's -- our polling on the issue of gun violence shows that a strong majority of Americans support much bolder gun violence prevention measures than have been considered in Congress in recent years. Consider that a 67 percent majority of Americans believe that guns should be harder to get. Seventy-nine percent support creating a government buy-back program for assault weapons. Seventy-eight percent would support a ban on military-style weapons. Eighty-nine percent would like to require gun licenses for all gun owners. It’s no wonder that Brett Kavanaugh refused to shake the hand of Fred Guttenberg, the father of a student who died at Parkland. We should be outraged. We should be outraged that we are dealing with a nominee who is willing to put the profits of the gun industry ahead of the lives of our children. 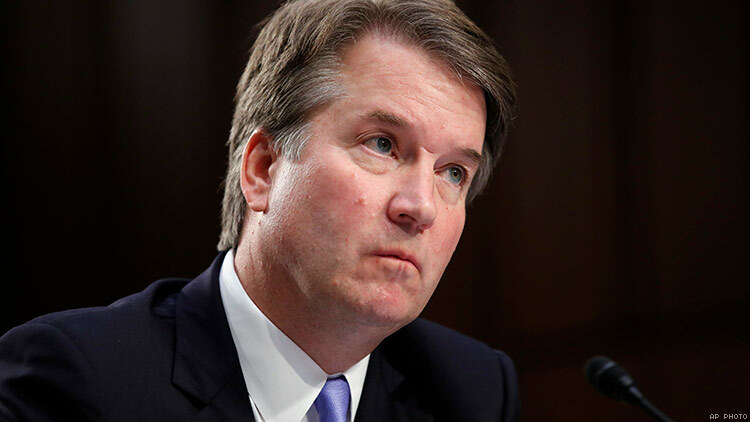 And we should channel that outrage into action, letting our senators know that if they reward this man with a lifetime appointment to the highest court of the land, they will be complicit in every single death that occurs as a result of rulings that will allow even more firearms to flood into our communities. IGOR VOLSKY is the executive director of Guns Down, an organization advocating for fewer guns. His forthcoming book, due out in the spring of 2019, makes a bold case for building a future with fewer guns. Igor has appeared on MSNBC, CNN, Fox Business, Fox News, and CNBC television, and he has been a guest on many radio shows.